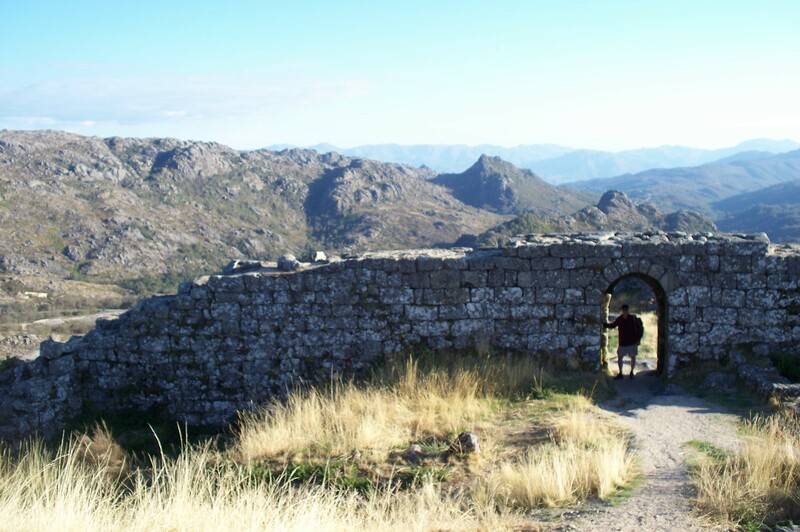 Though still on the frontier with Spain, the castle ruins above Castro Laboreiro no longer serve as border fortress. Away from the coasts; away from the rattling trams and rushing trains; away from the crowds and the nouveau cuisine and the latest twist on Douro winemaking, rise the stark black mountains of the El Minho region—Portugal’s far north, up near the border with Galician Spain—and the empty solitudes of its descending valleys and cliffs. Peneda-Geres National Park is not on the way to anywhere anymore, though signs still proclaim the Portuguese route of El Camino de Santiago. Despite the arresting presence of thin-bladed windmills set like a platoon of sentries across the bare hilltops, these mountains are where the old Portugal lies. 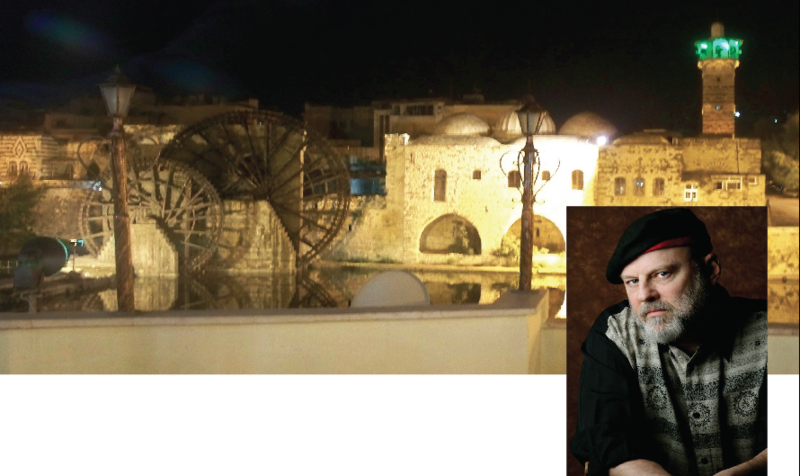 The land of shepherds and cowbells, sleepy villages and ancient menhirs and dolmens left behind from pre-history. Wolves and wild boar still roam the hillsides, though we found ourselves instead spotting wild ponies, and long-horned cattle, and having to wait while a flock of sheep crossed the road on their way home. 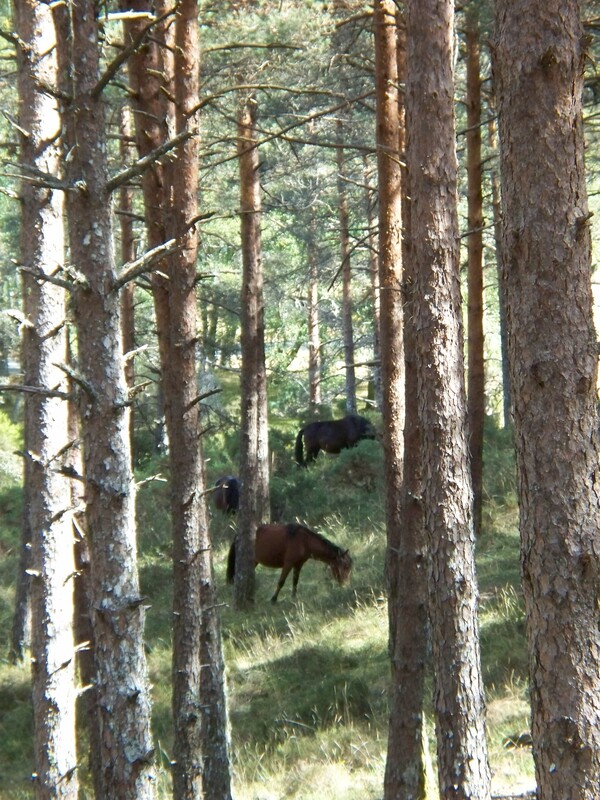 Wild ponies dot the hillsides and meadows of Peneda-Geres National Park. The land is rugged, and every structure in the villages appears made of stone; hard granite, usually, pulled from these very hills. The most intriguing structures are the espigueiros, which look strikingly like grave sites we remember seeing in the interior of Sumatra. 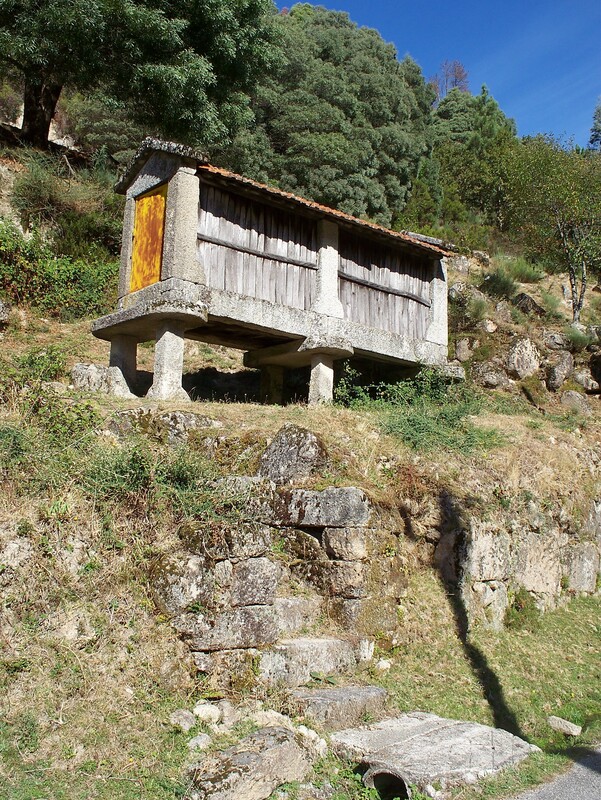 They are granite caskets on stilts, with open slots in the side for drying and storing corn. Stone granaries dot the hillsides like funerary plots. Inside the national park, over 100 granite villages still remain. Small places, but solid with the weight of years. The most magnificent is clearly Peneda, its houses scattered down both sides of a ravine in the lee of a granite outcropping that reminds us both of Yosemite’s Half Dome. The village is picturesque on its own, but as we walk the descending steps of the magnificent pilgrimage church of Igreja Senhora de Peneda—where an annual fall festival brings villagers from all over the region for music, dance and prayer, culminating in a candlelight procession through the plaza—we can feel the emotional heart of the historic region still beating strongly across the ridges and plateaus. 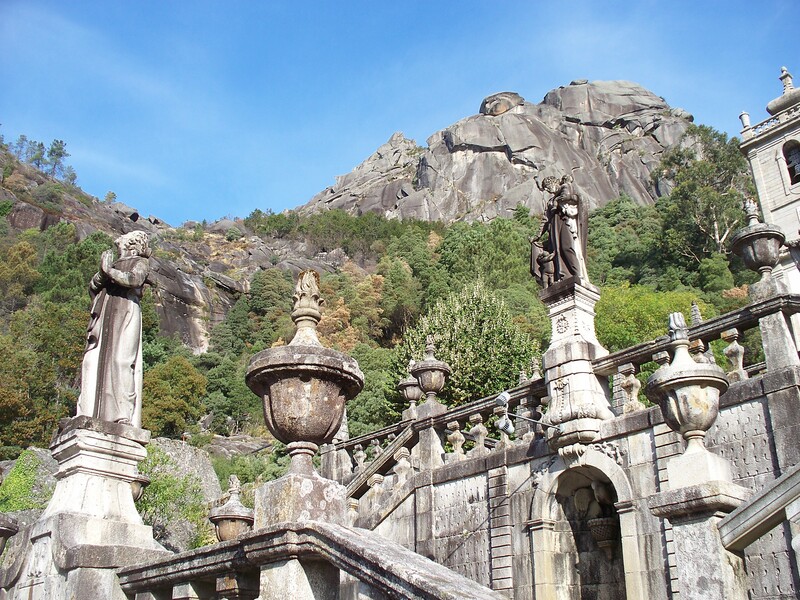 The pilgrimage church of Nossa Senora is set between mountain ridges. Something that festival can’t bring back are children. We hardly see any at all. Young people of any sort are few and far between. Jobs are limited. The future lies in the cities. The eyes of the old ones seem content, if a bit forlorn, but who will take their place? Amidst the stark beauty of the mountains, even alongside the gurgling streams, lies an underlay of sluggish finality, as if the very lifeblood of the region is not being suitably renewed. We think on this as we climb towards evening. Above us are castle ruins set on a stony ridge overlooking the village of Castro Laboreiro. We struggle up the rough path and through a boulder-strewn wasteland. The view from the ruins runs all the way to Spain, and the descending waves of hillsides ripple with shadows. In the distance, a single cowbell tolls. Sunset is not far away. 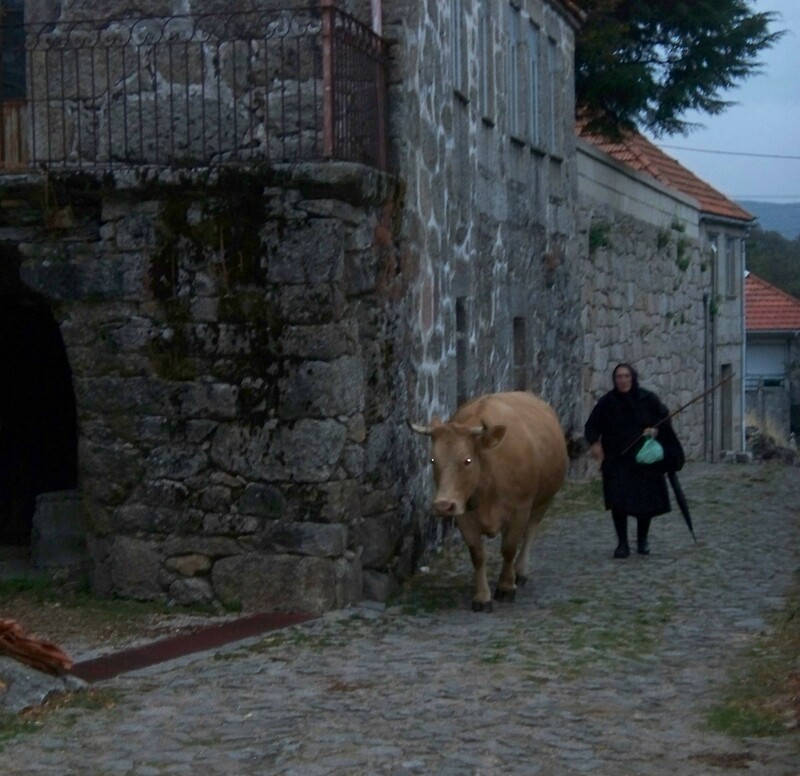 A timeless scene: dusk in Castro Laboreiro brings all the animals home. This entry was posted in Uncategorized and tagged absence of children, castle ruins, Castro Laboreira, Daniel Gabriel, granaries, granite outcrops, hiking, Igreja Senhora de Peneda, Minnesota author, Peneda, Peneda-Geres National Park, Portugal, wild ponies on February 8, 2017 by danielgabriel.